Vintage company films like this helped tell the story of John Deere's famous steel plow. Out of the Vault Series: From One Anvil takes you on brief industrial journey through time. Actor Monte Blue portrayed John Deere in early company films such as "From One Anvil." In the past, Deere & Company sometimes used promotional films to introduce products or celebrate historic milestones, much like videos produced today. 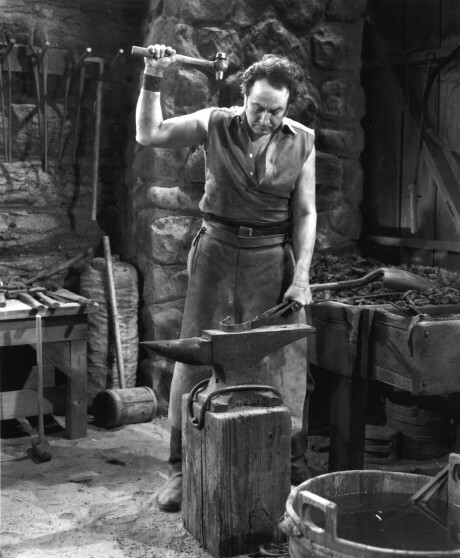 This clip is from the 1960 film “From One Anvil,” which was billed as a sequel to “Blacksmith’s Gift,” a film made in 1937 to mark the company’s centennial. “Blacksmith’s Gift,” starring a well-known actor of the day, Monte Blue, is the story of how John Deere made the steel plow, and its historical significance. It was the first John Deere Day film, and premiered in 1937 in Moline, Ill. Footage from that movie also appears in this clip. “From One Anvil”, is part of our ongoing “Out of the Vault” series, which features vintage films or artifacts from our company archives. View other films and stories from our "Out of the Vault" series.